New Profile "High Contrast Series"
"High Contrast Series" is a color profile specialized for photographs that suppress graininess and require smooth gradation expression. The desired color can be easily selected in RIP Software "RasterLink6." Speed is faster approx. 58% (max) when compared with conventional profiles. * Results may be slower depending on the media type. 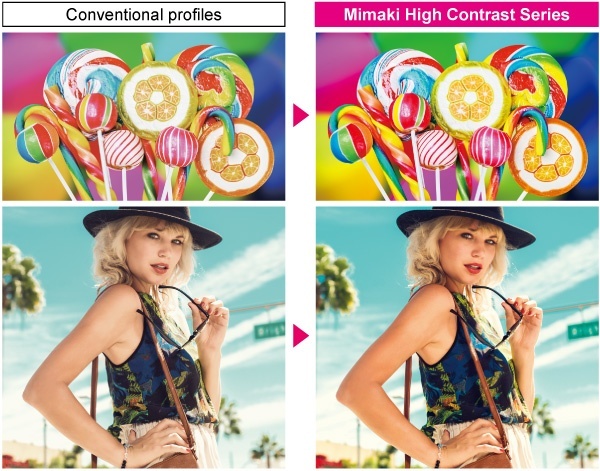 Depending on the needs, it is easy to select between high contrast expressions specialized in photographic images (High Contrast Series) and conventional Mimaki color (Wide Mimaki CMYK). To the above models, NEW profile has been added at profile information. * Last numbers and letters (Ex: v3.5sp) at the end of media product name indicates high contrast series. Set "Color matching" to "Mimaki_Expand_Color"
Choose media profile which ends in"v3.5sp"
Set up the desired "pass" * Depending on media setting up the "pass" varies. Please perform a test print before. * When printing on high contrast series, the heater temperature is setup high. This may result in unwanted marks, cockling and longitudinal unevenness due to static electricity. Please make sure to perform a test print before. For further information, please contact our closest office or our local distributors.